These kitchen jobs take around ten minutes. They can be done whilst waiting for something to cook, holding or chatting on the telephone, awaiting a delivery, listening to a song or the news, etc. Find five items in your line of sight right now that belong in another room. Put them back where they belong. 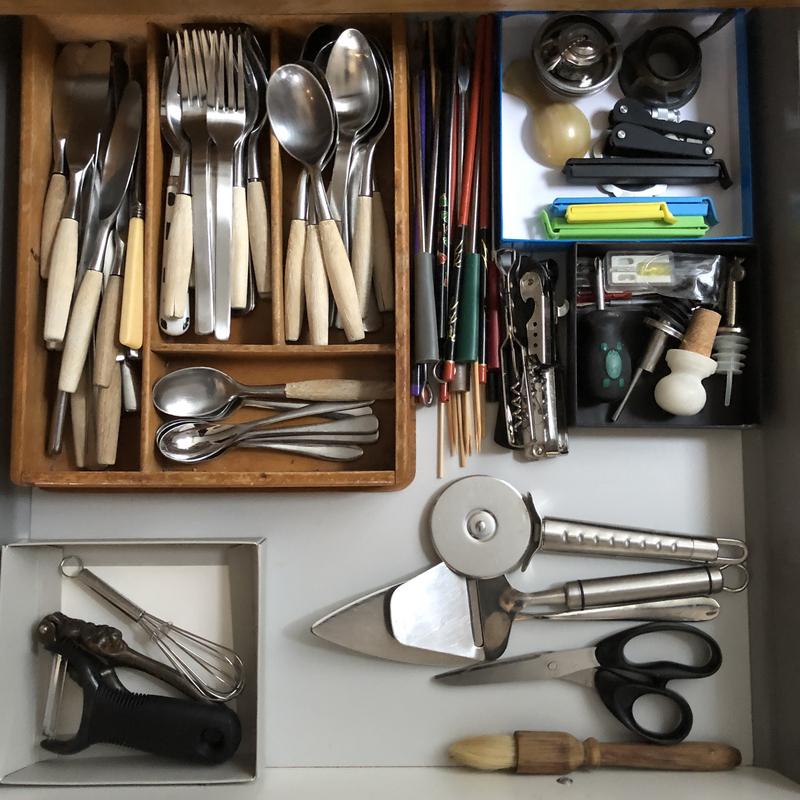 Take everything out of the cutlery drawer, lining it up in categories on the counter as you go. Clean the drawer. Clean the cutlery divider if you have one. Sort through everything on the counter then neatly return everything you want to keep. Dispose of unwanted items. Take everything out of the kitchen drawer (the one containing batteries, chargers, pens etc.). Sort it into categories on the counter. Clean the drawer. Maybe there’s some empty boxes or lidless tupperware you might use as drawer dividers to categorise the content you return to the drawer. Chargers and cables could go into individual, labelled bags. Dispose of unwanted items. Open the cupboard under the sink. Take everything out and sort it into categories. Dispose of anything you no longer need or use. Clean the cupboard and return everything, putting the items you use least at the back. Clean a window – get some more light in your home. Replace any spent lightbulbs. Wipe all the oil and vinegar bottles clean with warm soapy water. Clean the area where you keep them. Dispose of empties, return clean bottles to where they’re kept – try lining up the labels! Clean the outside of all the kitchen cupboards. 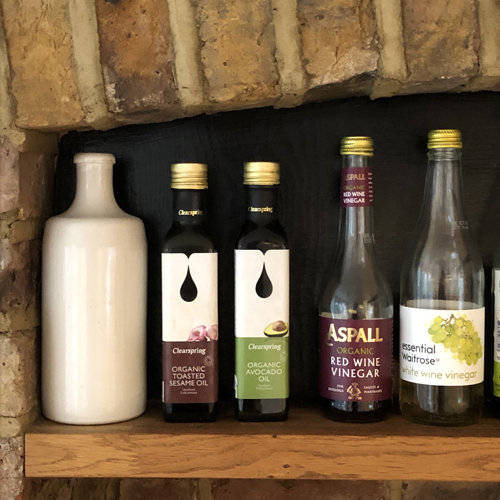 Take everything off one shelf (eg. crockery/glasses). Put items on the counter/table in categories. Clean the shelf. Ask yourself if you still need everything you’ve laid out and dispose of everything you don’t. Return the items you want cleanly and neatly. Top tip: if you’re not sure about a particular item, label it with today’s date and a “if not used by X weeks/months, let go”. Descale the kettle/coffee machine and empty the toaster of crumbs. Clean the area they sit in. Use baby oil to shine up chrome items. Stretch or breathe in and out for as long as it takes the kettle to boil. I’m a massive fan of the ten-minute job. These are small, achievable tasks we can finish in a short period of time. Completing just one of them has immediate, visible results. When there’s a lot to organise and we don’t know where to start, a ten-minute job can be a great entry or warm-up. Read on to find out more or scroll to the bottom for some generic, room specific ten-minute job ideas. What relevance does self-compassion have to organising and decluttering our homes? 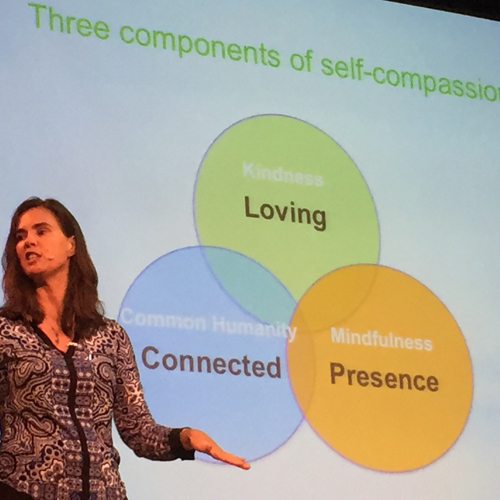 The more I do this work, the more I want to give the self-compassion gift to my clients, my friends – and me.